Welcome! 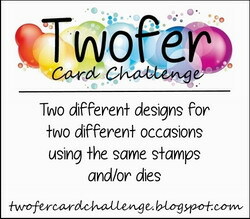 I have another card for Stamp TV's Mix It Up Monday challenge inspired by the photo on the left. 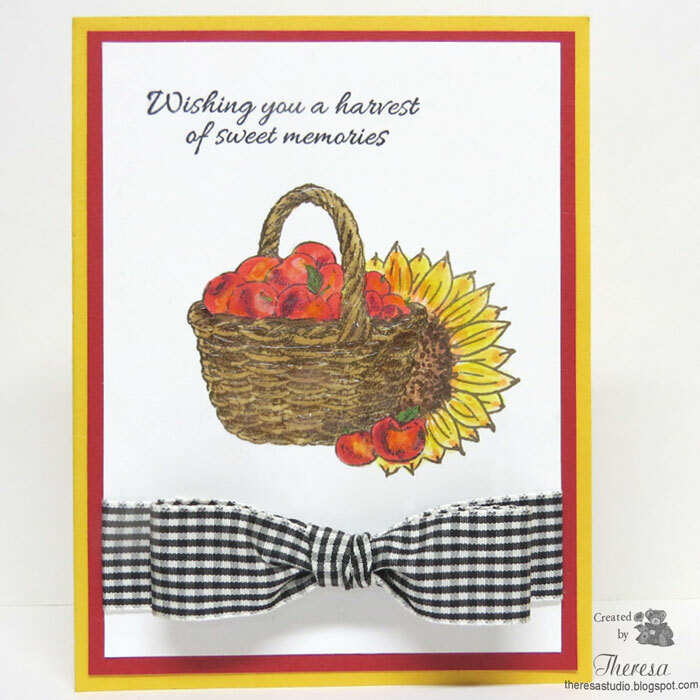 I chose to use Black and White Gingham ribbon for a bow on this card. The stamps used are from GKD's Harvest of Flowers (Basket of Apples and Sentiment), A Year of Flowers (Sunflow er), and Botanicals (Berries). 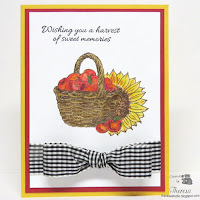 I used Memento Rich Cocoa ink for stamping and Copics for Coloring. Glossy Accents was added to the basket for a bit of texture. 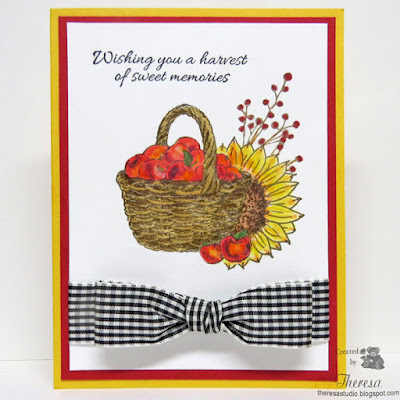 I thought I was finished with just the basket and sunflowers but added the berries after I made the first photo shown below. 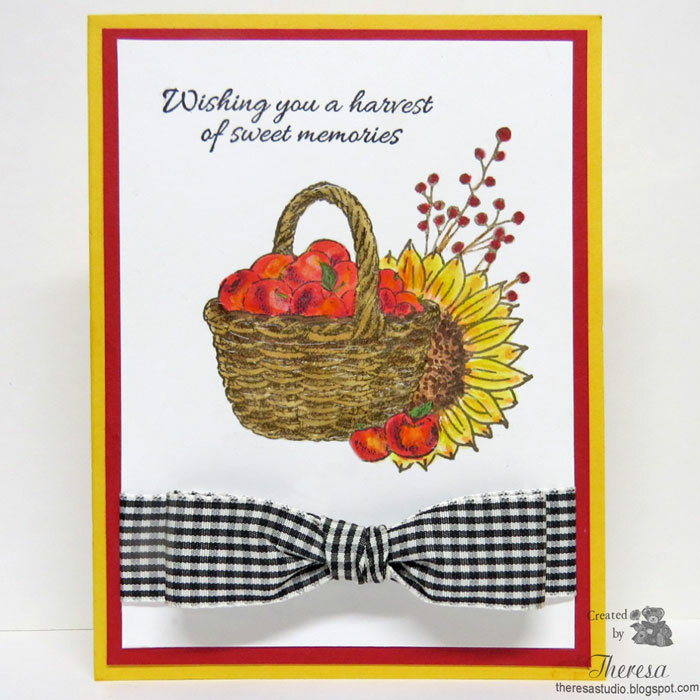 When I looked at the first photo, I thought it needed a bit more and the berries was just the right touch needed to complete the card and picked up the berries from the inspiration photo. Really Reasonable Ribbon: Challenge 172 Anything goes with ribbon. theme. Welcome! A third post for today. 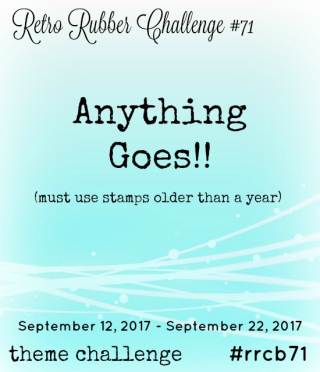 As the month nears the end, I am trying to enter some challenges that end soon. 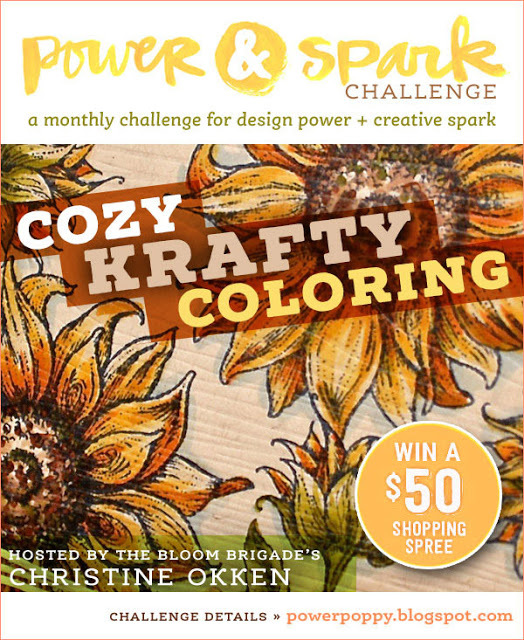 This card was made for the challenge at Power Poppy to use Kraft colored paper for a project. I decide to use Power Poppy stamps from the Sunny Harvest set. I tried several mediums on Kraft CS including Distress Oxide Inks and Markers without success and then used pencils to color the image after stamping with Memento Rich Cocoa ink on the Kraft. This came out to my liking. I added Glossy Accents to the red berries and used Sakura Clearstar Pen on the Lanterns. 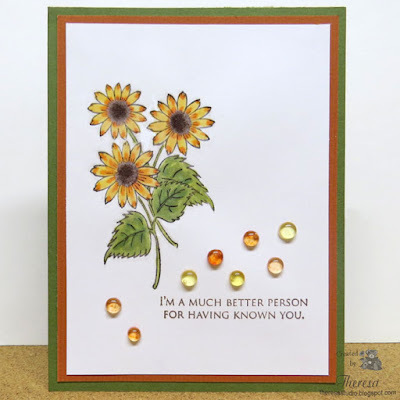 I cut the image with a Spellbinders Die and attached it to a Layer of Metallic Copper CS and then to a layer of Rusty Orange CS and a card base of Green. 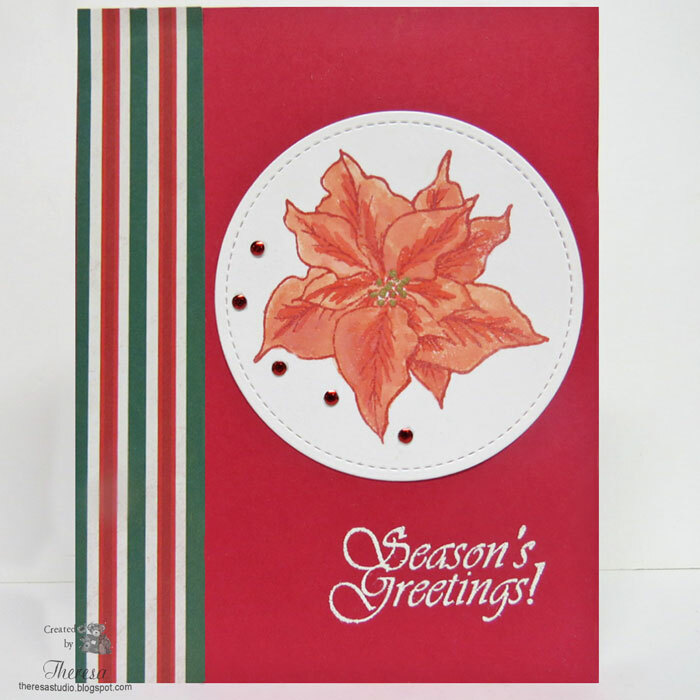 The Power Poppy sentiment was stamped with Versamark and embossed with Copper Metallic EP. The Copper CS and EP look really good in real life and add a lot to my card. I wished that they showed better in the photo. 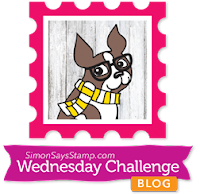 Simon Monday Challenge: Heavy Metal - use metal embellishments for example, charms, or metallic embossing powders, card stock, foils etc. 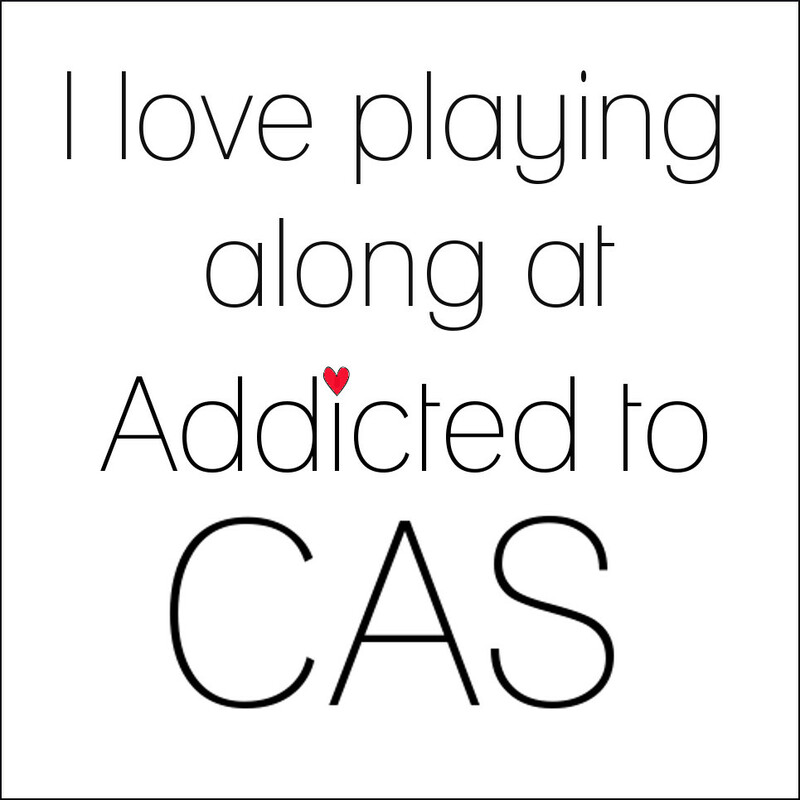 I used metallic EP and CS. Hello! I have another quick card for today. 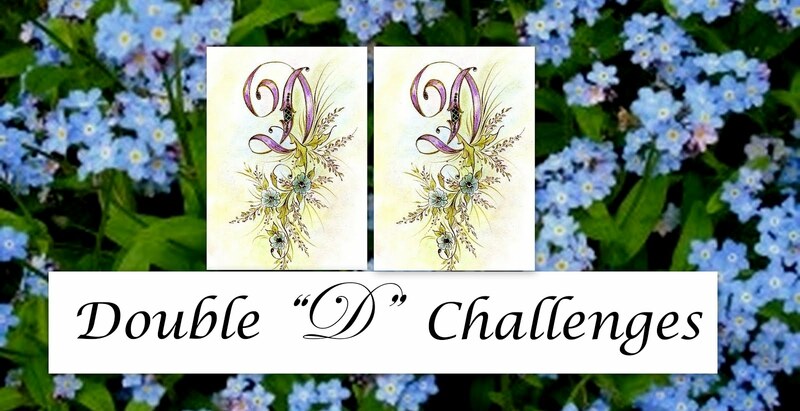 This is a Sympathy card that I made for the challenge at The House That Stamps Built DCC96. I am trying to complete all their challenges for the month of September. 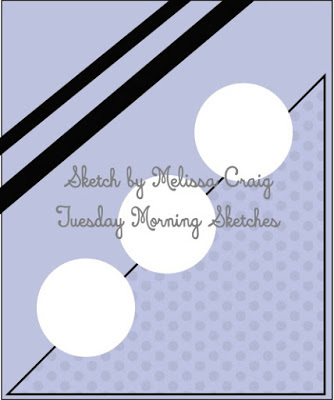 I used a sketch from Sketch Saturday to design the card. I used Repeat Impressions Lily of the Valley stamp with Memento Bamboo Leaves ink on white CS and colored with markers. 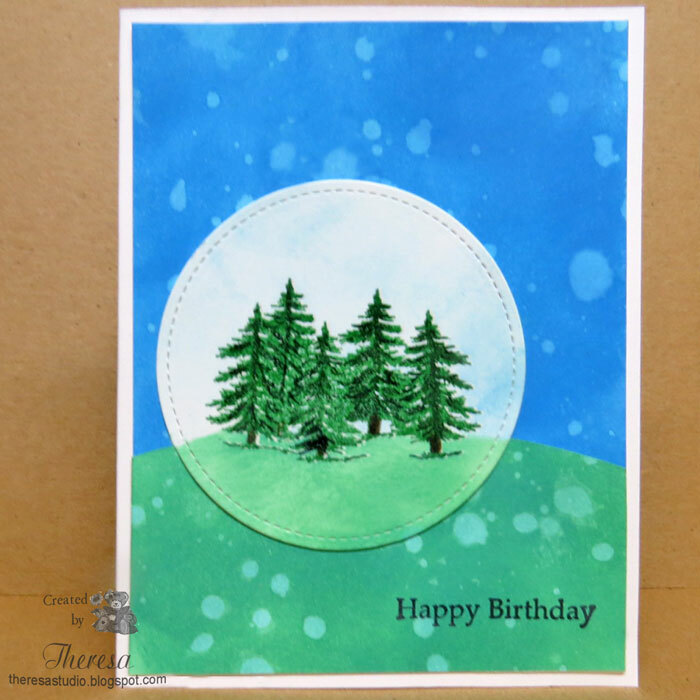 I placed this on a mat of Graphic 45 Pattern Paper from Secret Garden Pad and used the green paper from the same pad to complete my card. The sentiment was from GKD. Used white gell pen on the flowers. Hello! It is nice that we have cooler weather! 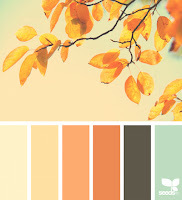 I am looking forward to fall and love the flowers of the autumn season. My card today features a Sunflower stamp from GKD Always Autumn set. I stamped 3 flowers on watercolor paper with Distress Oxide ink and colored with more of the Oxide inks. 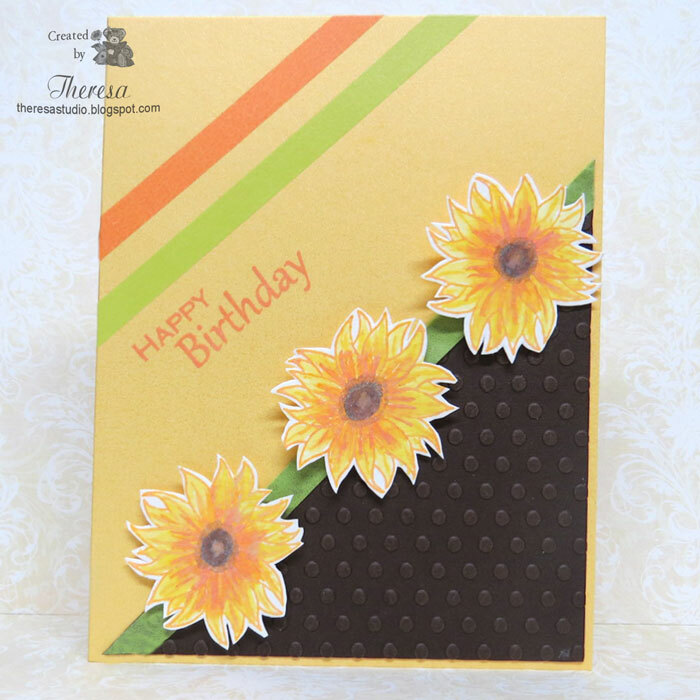 I fussy cut the flowers and arranged on a Shimmering Yellow Pearl CS base striped with Washi tapes and layered with an embossed Brown CS panel. Finished with GKD sentiment. 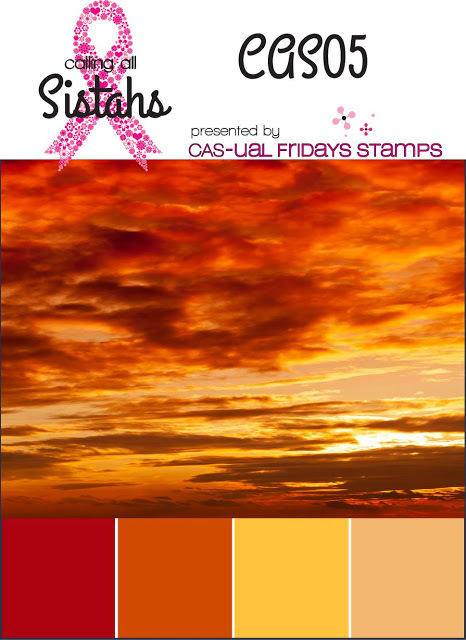 Oxide inks used were Fossilized Amber, Spiced Marmalade, Wild Honey, and Walnut Stain. 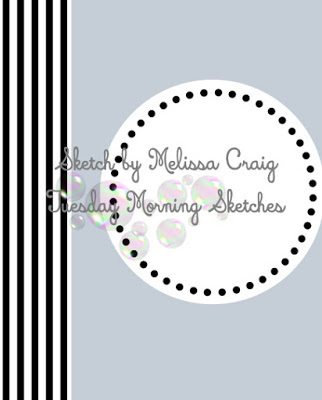 The Washi tape was from a prize from Tuesday Morning Sketches. Welcome! 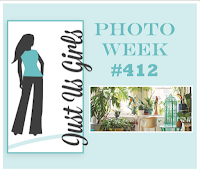 The inspiration for my card today comes from the Photo for Just Us Girls Challenge shown below. I was reminded of Dies for a Bird Cage and Tropical Leaves that I have and used them to create this card. I thought of seeing old bird cages being used as a planter. 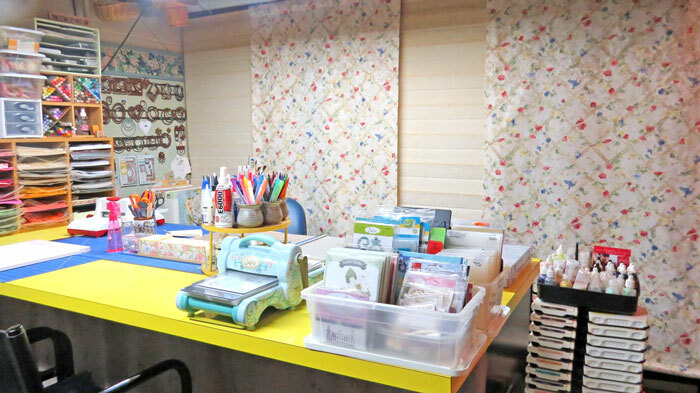 Washi Tapes (colors from the photo) were used as stripes on lower edge. 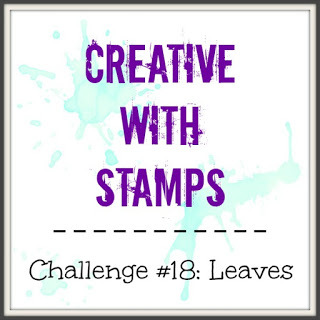 Other supplies: GKD Stamps, Spiced Marmalade Distress Oxide Ink, Clear EP, Cheery Lynn Tropical Leaves and Olive Branch Dies, Marianne Dies, White CS, Blue CS's, Scraps of Green CS's. 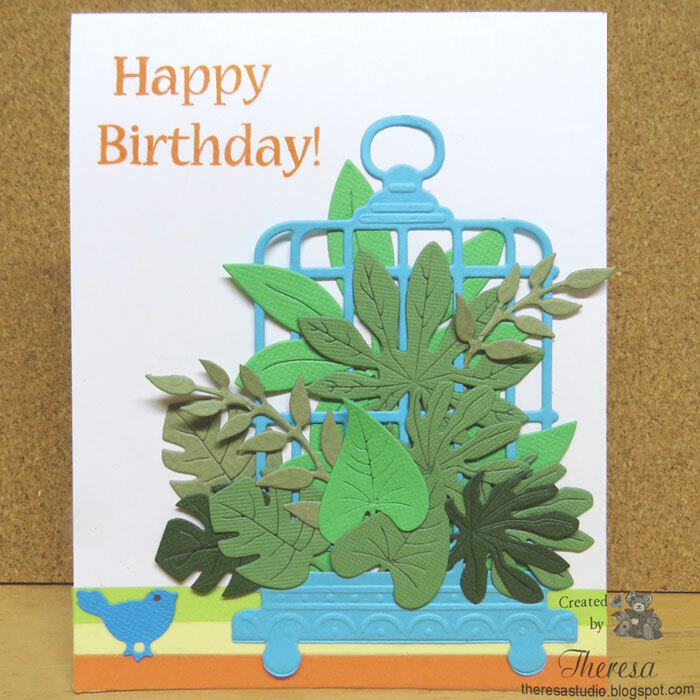 For a touch of whimsy, I added a die cut bird looking up at his cage wondering "What happened to my house?" Hello! 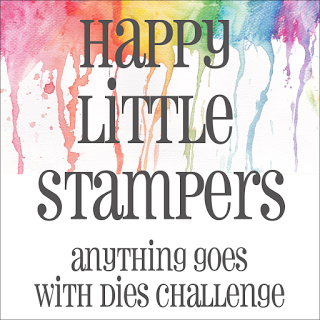 I made this card for one of the challenges at The House That Stamps Built this month. 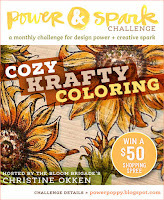 It is good that Wendy extended the submission dates for challenges this month so I have time to play along. 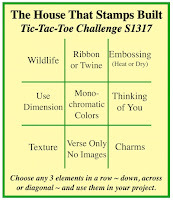 The challenge is a Tic Tac Toe one....I selected the top row -Wildlife, Ribbon or Twine, Embossing. 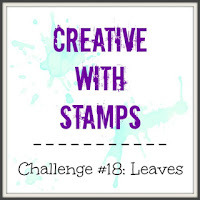 Supplies: Repeat Impressions Stamps, Memento Rich Cocoa and Bamboo Leaves Ink, Copics, Clear EP, Spellbinders Die (used to frame the image with embossing and cut out), Argyle EF (embossed PP layer), Pattern Paper from DCWV, Green Twine, Kraft CS, White CS, White Pen. As You Like It Challenge: Favorite Paper Pad-DCWV Safari Chic Mat Stack. This is a fave pad because it has a great variety of patterns for masculine cards and for use with animals. 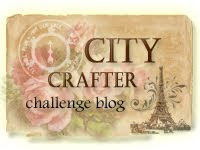 Crafty Catz Weekly Challenge: #385 Birthday Party Time. Happy 8th Birthday to everyone at Crafty Catz! Just Add Ink: Challenge 378 Just Add Texture. 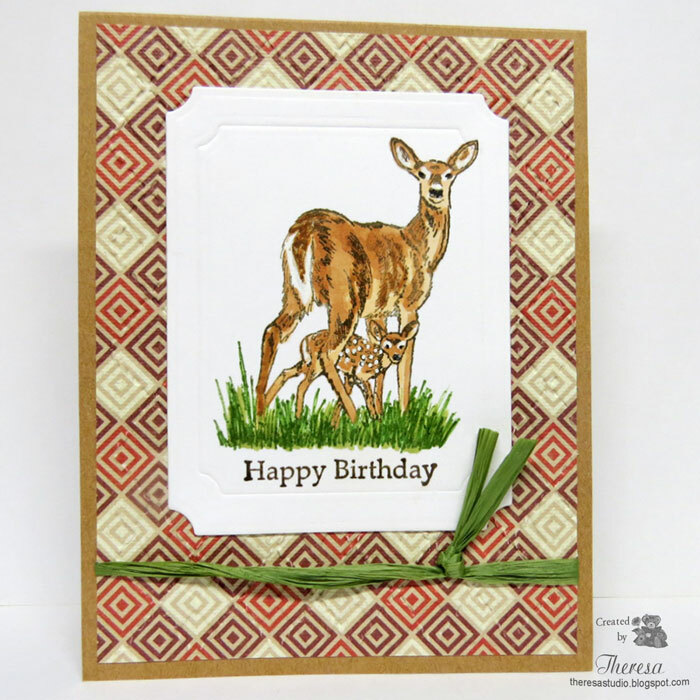 Texture added with Embossing and Twine. Hello! Another fall card! 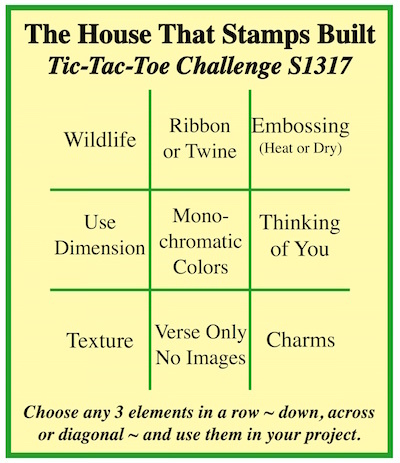 The inspiration for this one was the Photo Challenge at The House That Stamps Built shown below. I used Distress Oxide Inks Antique Linen, Fossilized Amber, Spiced Marmalade, Wild Honey, Iced Spruce, Vintage Photo, and Walnut Stain (which covered all the colors in the pallete) to stamp and watercolor the Repeat Impressions stamp on watercolor paper. The RI sentiment was stamped with Iced Spruce. 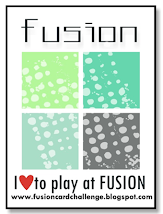 I trimmed the image and attached to a cardstock from my stash. Hello! 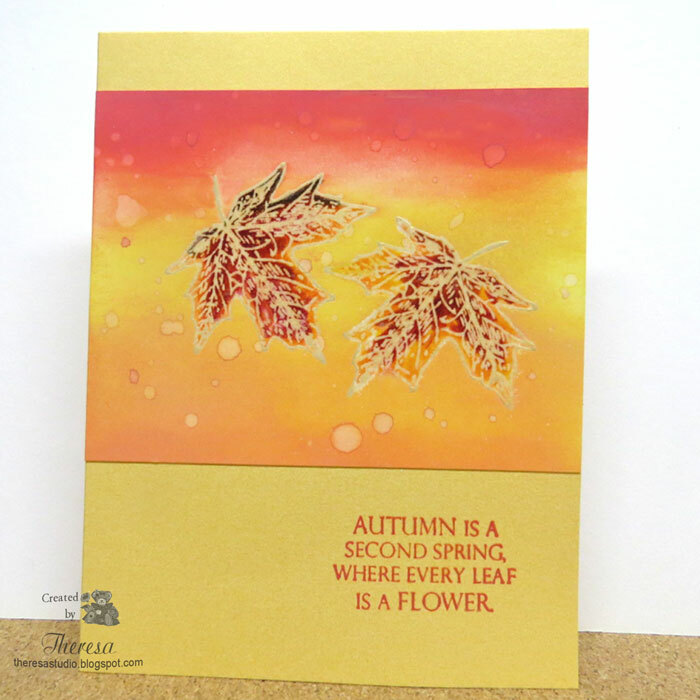 Today I have a fall/autumn card made using emboss resist technique with Gina K Design stamps and Distress Oxide inks. 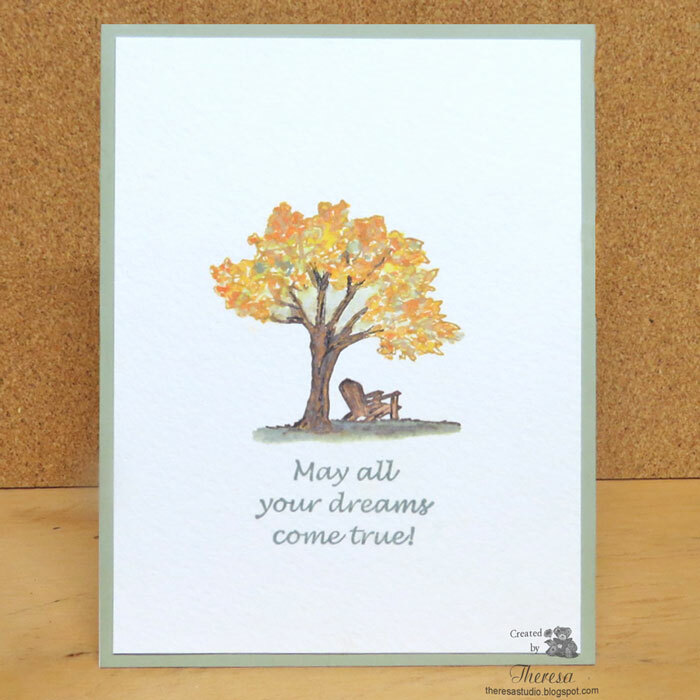 The leaves were stamped with Versamark and embossed with Pearl Gold EP and colored with Memento Markers. Sponged over the leaves with Candied Apple, Fossilized Amber, and Spiced Marmalade oxide inks. Card Base is shimmering Yellow Pearl CS. The leaves almost have a look of stained glass. 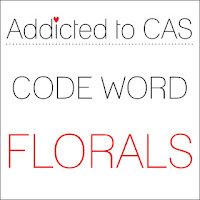 Calling All Sisters: CAS05 Encouragement Challenge. See Photo Inspiration below. 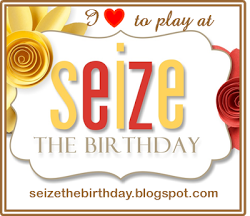 Thanks Gwendolyn for asking me to share my card. Hello! 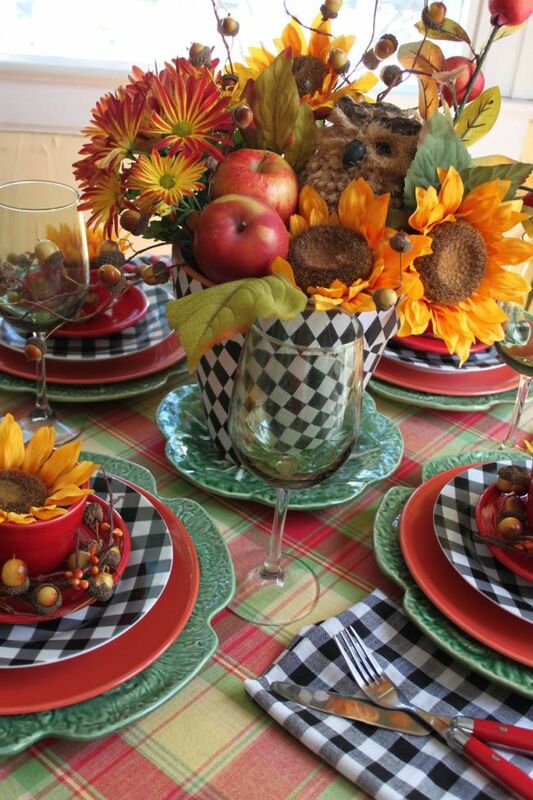 Fall is here and so are fall flowers. My CAS card today features a Sunflower stamp from GKD Signs of Autumn, an old stamp set from 2009. I stamped the image with Memento Espresso Truffle ink on white CS, colored with Copics, and then heat embossed with Clear EP using a Versamark Pen. I stamped the GKD sentiment from Elegant Flowers (another old set) with Distress Ink Oxide Walnut Stain. 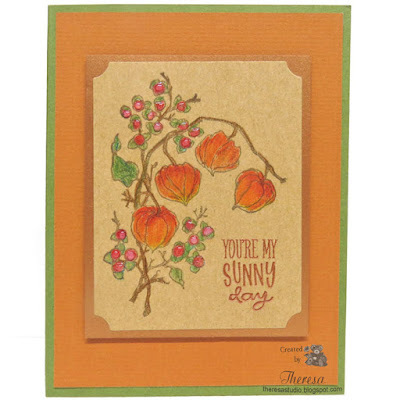 I attached to a layer of Pumpkin CS and then a card base of Green. Finished with Dew Drops in autumn colors. Hello! 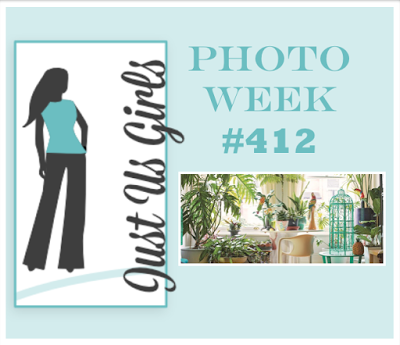 This tag was inspired by challenge #73 at Tag You're It! shown on left. I used Distress Oxide inks and Emboss Resist similar to the way that featured artist Tracey did but I made my theme Christmas using stamps from a freebie set from Quick Cards and Die cuts from Cheery Lynn. Used Worn Lipstick and Salty Ocean Distress Oxide inks. 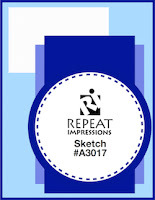 Other supplies were Versamark Ink, White EP, White Cardstock, and White Satin Ribbon. 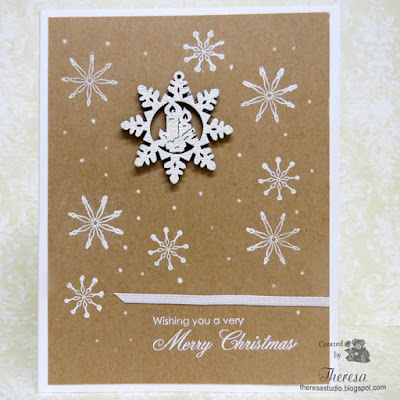 I also created a card with a tag by using a White Card Base and a layer of White CS embossed with Darice Snowflakes EF and inked the raised areas with Salty Ocean Distress Oxide ink. 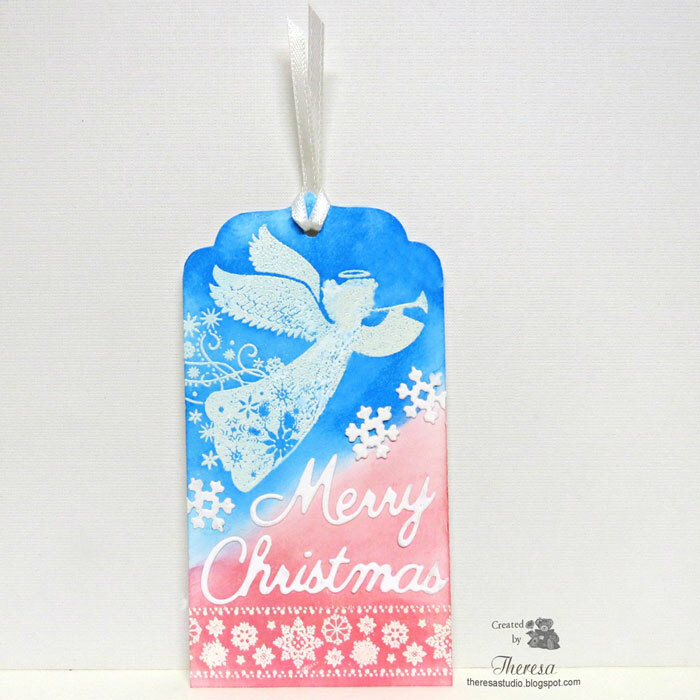 I added some shine to this tag with a Metallic Gold Jelly Pen and Sakura Clearstar Pen. 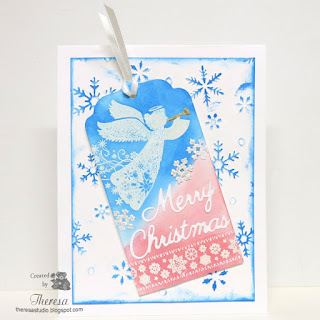 Craftyhazelnut's Christmas Challenge: #352 Anything Goes as long as it is Christmas. 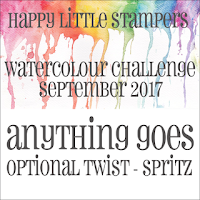 Craftyhazelnut's Christmas Challenge Extra: September Anything Goes as long as it is Christmas. Hello! 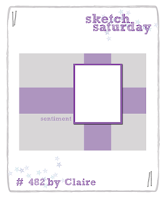 I am back to post a quick card for The Paper Players challenge using Laurie's sketch #359 shown below. This was a card that almost did not happen. I had stamped the image from Repeat Impressions, colored it, and die cut it with a circle die thinking I would use it for a Christmas card but I decided that it was too bright and the wrong colors so I set it aside. Then I saw this sketch and decided I'd use it with a Distress Oxide Background that I made and did not use for another project. Thus this card evolved from my "rejects". 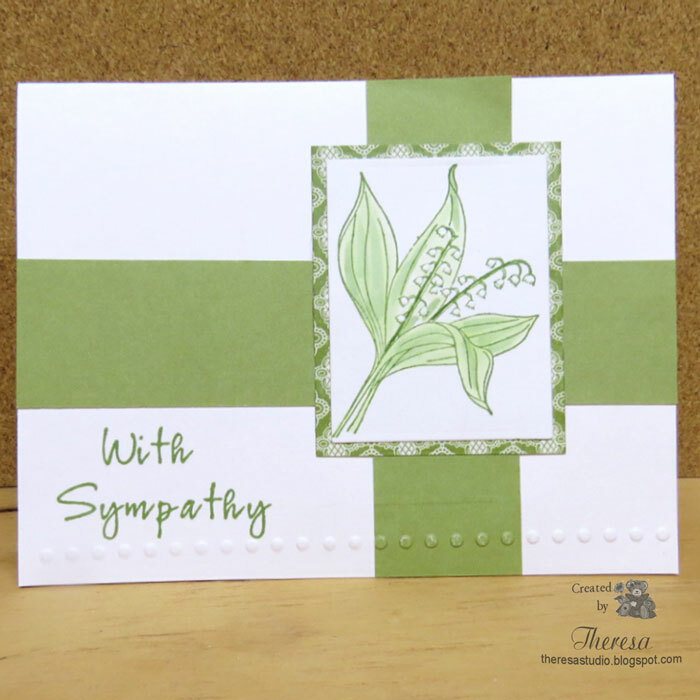 Finished it up with a White card base and RI sentiment. Now to make the deadline. Welcome! I have begun making Holiday cards to be ready when the season arrives. 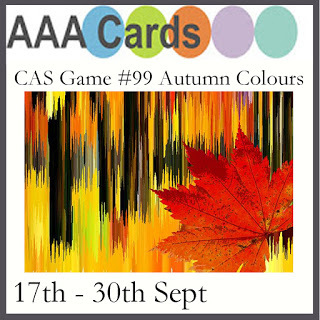 I am sharing 3 cards in this post. 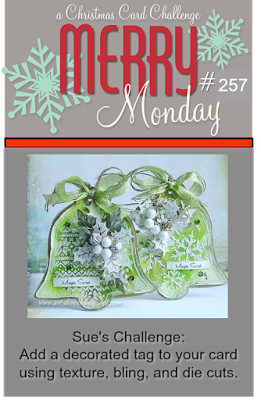 The top card uses a sketch from Tuesday Morning Sketches and some items that I won recently in one of their challenges - DCWV Paper Pad The Christmas Basics and Bling It Nail Heads. 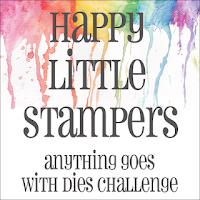 Other supplies: GKD Stamps, Distress Inks, Versamark Ink, White EP, Red and White CS, Gold Metallic Gel Pen. Circle Die. 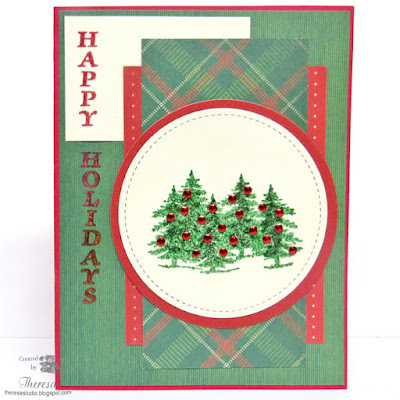 The second card uses the sketch from The House That Stamps Built with Repeat Impressions stamps with more papers from The Christmas Basics pad and the Bling It Nail Heads. 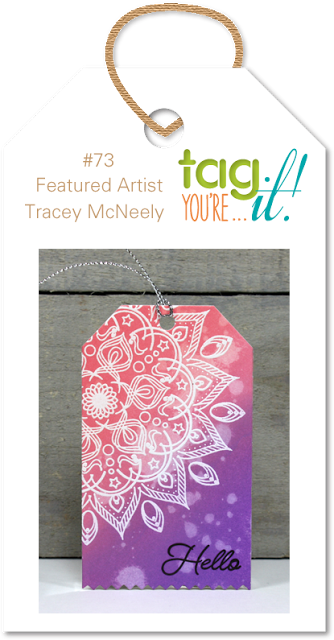 Other supplies: Memento Inks, Red CS from stash, Clear EP, Circle Dies. 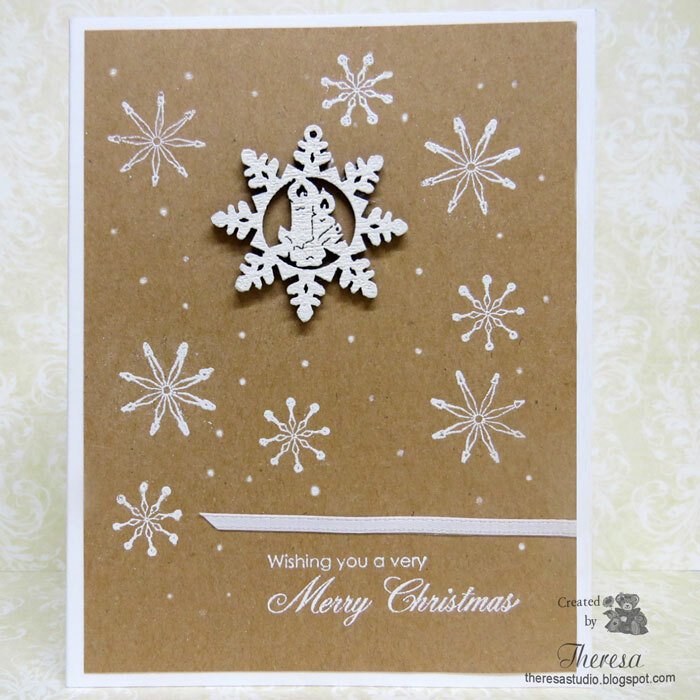 This Christmas card was made for a color challenge using GKD Snowflakes and Sentiment stamps. 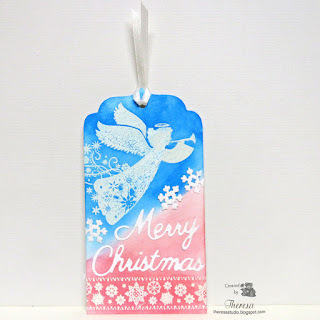 Other supplies: Kraft and White CS, Versamark Ink, White EP, White Gel Pen, and a Wooden ornament embossed with White EP, and White Satin ribbon. Craftyhazelnut's Christmas Challenge: #348 Anything Goes with Option to use something old. Used old stamps. 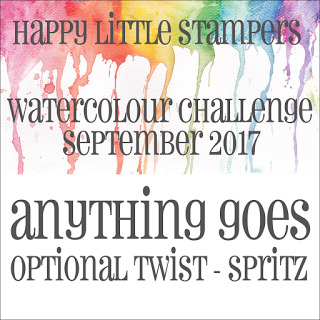 Craftyhazelnut's Christmas Challenge Extra: September Challenge Anything goes fro Christmas.